The MegaPAC L1 product is a robust portable computer built using all aluminum sheet metal to provide tough, go-anywhere unit suitable for tough environments and mobile applications. 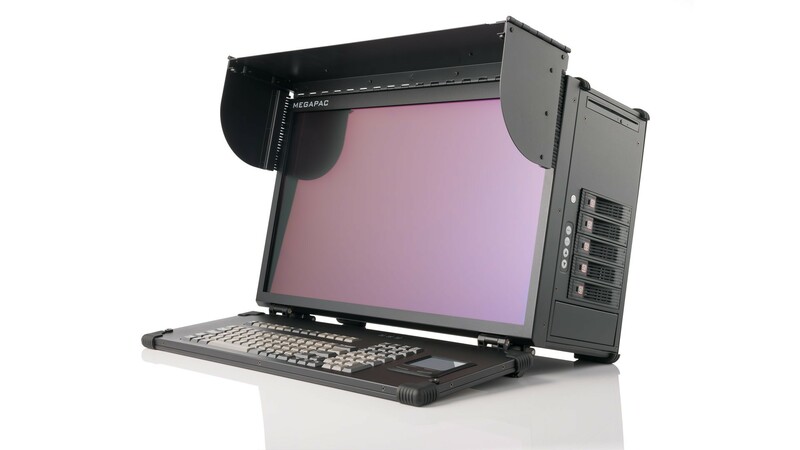 With the 23”, HD LCD display (optional upgrade: 23.8" 4K Display) and 7-expansion slots design, the MegaPAC L1 can easily fulfill requirement for digital media related applications in the broadcasting market. The MegaPAC L1 can also be configured with many special add-on cards for your unique applications. The integrated visor-shade optimizes viewing when ambient light or sunlight has become distracting. Optional touch screen allows MegaPAC L1 to operate without keyboard for quicker operations. Every unit comes equipped with cooling fans and easy access to its expansion slots for immediate system upgrade or maintenance. With its functional design and rugged construction, the MegaPAC L1 is the most durable and versatile portable platform for your applications. The MegaPAC comes with a 23” 16:9 LED backlite LCD at full HD resolution of 1920x1080. The integrated visor-shade and high contrast ratio optimizes viewing in ambient light. Overall, the large, wideview LCD with low latency, high contrast ratio, and visor-shade allow the user to see details that would have otherwise been overlooked. In addition to its large display, every unit comes with cooling fans and easy access to its 7 full-length expansion slots for immediate system upgrade or maintenance. Video Card Max Dimensions (L x W): 12.28" x 5.39"